So I've recently decided to expand my knowledge of FTD and develop my own aircraft. I have come across some very odd behavior. 1: I added wings, tail planes, the whole lot onto my bomber and proceeded to watch it head into orbit and do barrel rolls all day long. 2: I removed all the wings, tail planes, everything and just used thrusts to find out my aircraft flies perfectly now. I am.. SO many levels of confused and concerned. Is there something I'm missing in this or is that a valid means of aircraft operation? Any help or advice is appreciated and yes I have read some of the guides on here and tries to use their knowledge though I don't quite understand some of it as much as I would like to. That would be called a "thrustercraft". It is a perfectly valid means of aircraft operation. Many military aircraft nowadays don't even use their wings for lift all that much thanks to things like vectored thrust, VTOL, and extremely high thrust to weight ratios. Wings are an alternative to using purely thruster-based craft, and usually more efficient. If your plane flew like this it may have had too many. Forces in this game aren't extremely realistic and thrust forces are particularly so. It doesn't take much to get a brick flying with jet engines. If you want to get a "realistic" flying plane, you might try dedicated heliblades to start, and always be aware of where your center of thrust is relative to center of mass (esp if you have wing blocks, which apply a passive vertical thrust). Been testing non cheezy vectored thrust and found it much more usable tyan one may think. It takes time to configure tho. The hardest part is the "stabilization when damaged" to me. 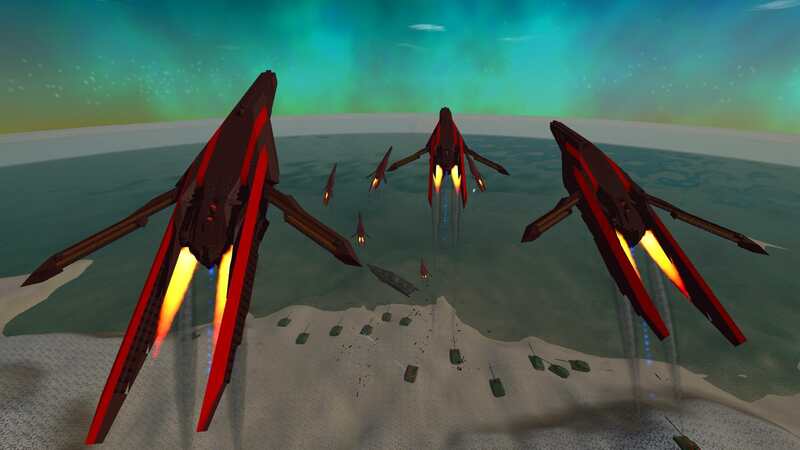 (2018-11-02, 01:56 AM)BioPhoenix Wrote: That would be called a "thrustercraft". It is a perfectly valid means of aircraft operation. Many military aircraft nowadays don't even use their wings for lift all that much thanks to things like vectored thrust, VTOL, and extremely high thrust to weight ratios. There are only a handful of military fighters capable of VTOL and only slightly more that utilize vectored thrust. All tend to have very high thrust to weight ratios but aside from a few thrust-intensive maneuvers (such as near-vertical climbs) they all very much use their wings for lift. What their power allows them to do is get away with proportionally smaller wings. -long ago the wings, tailplanes, etc, were very weak components so you needed a tone. to 'fix' this they were massively buffed so you can now lift quite a lot with only a few and as a result they tend to suffer from overshoot/too much power when used on small designs. Thrustercraft are much easier to configure and generally more responsive to complex control schemes due to the ease with which their power can be adjusted. As such I would suggest going with thrustercraft and saving 'real' plane components only for aesthetic or skill builds. If you're looking for a good example of a competitive 'real' plane look at the Steel Strider Hake but also note how it reacts to even light damage. I get it much better now.